Vishnu, (from the Sanskrit root ‘vish’, to pervade) is the second god of the Hindu triad (see Trimurti) and as the preserver of the universe represents mercy and goodness. He is said to be the cosmic ocean nara, meaning water, which was the only thing in existence before the creation of the universe. 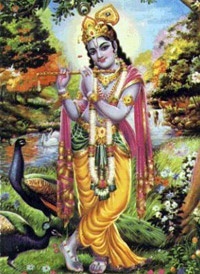 For this reason, he is also known as Narayana, or “one who moves on the waters”. Sleeping Vishnu on the Bed of Sheshnaga. Vishnu is represented as a dark man with four arms. In one hand, he holds a club, in another a conch shell (see Shankha), in the third, a discus (Chakra), and in the fourth, a lotus (Kamal). He is usually dressed in yellow robes and therefore also known as Pitambara, or “one with yellow garments”. The river Ganga is said to originate from Vishnu’s feet. He is also depicted as resting on a coiled serpent Seshnaga or Ananta (see Snake Worship) which floats on the cosmic ocean. According to the Mahabharata, Vishnu’s abode, Vaikuntha, is made of gold and .jewels. However, he is usually depicted reclining on Seshnaga, who floats on the cosmic ocean. His vehicle is Garuda, and his weapon is the discus, Sudarshana Chakra. Vishnu’s consort is Lakshmi, the goddess of wealth and fortune. She is believed to have emerged from the samudra manthan, and considered to be the daughter of Bhrigu and Khyati. She is a fair woman who wears red clothes, and is always depicted as sitting or standing on a red lotus (see Kamal). She is often worshipped by herself as Sri, Bhagya Lakshmi and Dhana Lakshmi, the goddess of all things auspicious, of good fortune and wealth. Vishnu is a very popular deity and is widely worshipped. The Vishnu Purana details the benefits of his worship. He has a 1,000 names, whose repetition is believed to bring great merit. He is also worshipped as Satyanarayana. Apart from this, there are many other vratas and festivals related to Vishnu. A variety of ammonite fossils, the shalgrama shila, is believed to be a form of Vishnu and is widely worshipped. There is also a specific arati associated with Vishnu, which eulogises him. Those who believe in the supremacy of Vishnu over Shiva are known as Vaishnava. They can be distinguished by their tilaka, which is different from that of Shiva. Vishnu as the preserver is not mentioned in the Rig Veda (see Veda). In the text, he is considered to be the manifestation of solar energy. His role as the preserver was established by the Puranas. The Padma Purana describes him as the Supreme Being, identifying him with Brahman . It states that Vishnu, wanted to create the universe. To this end, he divided himself into three parts: from his rightside, he produced Brahma the creator; from his left, he produced Vishnu, the preserver; and from his middle, he produced Shiva, the destroyer. 1 : Matsya or the Fish incarnation : in this form Vishnu saved the Saint Vaivaswata, the hindu variety of the biblical Noah (or vice versa). 2 : Kurma or the Turtle incarnation : at the Churning of the Ocean, Vishnu as Koorma (or Kurma) offered his back as a pivot on which to rest the Mount Mandara, used as a churning stick by gods and demons. 3 : Varaha or the Boar incarnation of Vishnu : he killed the demon Hiranyaksha, recovered the stolen Veda’s and released the Earth from the bottom of the ocean. 4 : Narasingha or the Lion incarnation : as a creature who was half-lion and half-man, Vishnu killed the demon Hiranyashasipu, brother of Niranyaksha, who had gained the boon of immunity from attacks by man, beast or god. 5 : Vamana or the Dwarf incarnation : he killed the demon Bali, who had gained dominion over the Earth and had chased the gods from the heavens. 6: Parasurama : he killed the King Kartavirya, who had stolen the holy cow Kamadhenu, which could grant all desires. 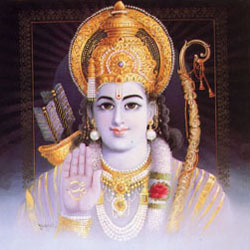 7 : Ram: he killed the demon King Ravana, who had abducted Sita. 8: Krishna: he killed Kansa, son of a demon and the tyrannical King of Mathura. 9 : Buddha : Vishnu incarnated to remove suffering from the world. 10 : Kalki : still to come at the end of the Kaliyuga or the present age of decline, when Vishnu will appear in person on Earth, seated on a white horse, Kalki, which is his tenth incarnation.